During these dog days of August, we take note that both NASA and the Japan Meteorological Society have confirmed what many enduring the Middle Eastern “heat dome” may have long suspected: July, 2015 was the hottest on record. 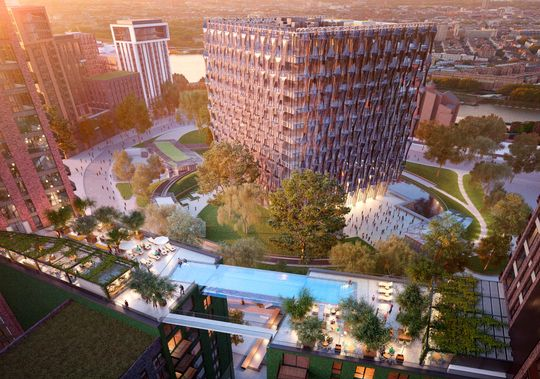 The month’s heat fired up the imagination of one Sean Mulryan of the Ballymore Group, in concocting a new development named Embassy Gardens, with its two towers linked by a “sky-pool swim-bridge”, or some such luxe-marketing blubber. Alas, the distortion of the interface ought be the least of Mr. Eckersley’s worries; if he wishes to focus his considerable intelligence on a subject worthy of his anxiety, he might consider the fate of Gunther Anders’ inverted utopians, for whom he is such an eloquent if unwitting mouthpiece. UNABLE TO IMAGINE THE THINGS WE MAKE? This entry was posted on Saturday, August 22nd, 2015 at 13:43	and tagged with ballymore sky pool, banksy dismaland, inverted utopians and posted in bearings, DP. You can follow any responses to this entry through the RSS 2.0 feed.